Written by Garrett W. on July 22nd, 2016. 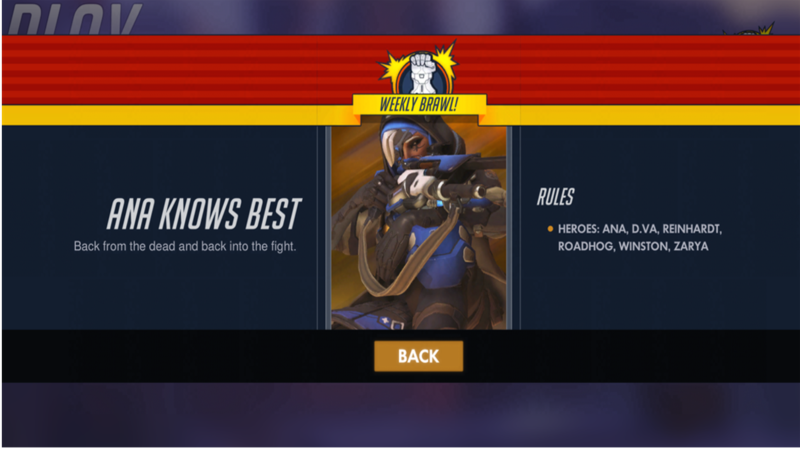 I was pleasantly surprised to see this week’s Weekly Brawl for Overwatch is “Ana Knows Best”. This brawl is designed around the newest hero to Overwatch, Ana. Your character choices are either her or the tank heroes (Roadhog, D.Va, Winston, Zarya, and Reinhardt). I guess you could also call this brawl “Tanks a lot Ana”. Okay, forget the joke. The hero selection is the only stipulation in this brawl. It may not seem interesting on the outside, but in-game I found it to be fun, and a great way to welcome our new hero. For those of you who haven’t been following Overwatch recently, Ana is a new Support-Sniper hero. With her bullets, she can heal/buff allies, damage opponents, or put enemies to sleep. She has arguably more powerful abilities than the other supports, but requires more skill to be used effectively. Besides Roadhog’s “Take a Breather” ability, the Tank heroes don’t have self healing abilities, meaning they must rely on their Support heroes to heal them in battle. In this brawl, the only Support hero is Ana. In order for Ana to heal allies, she must shoot her allies or throw her Bionic Grenade at them. Unlike Lucio’s AOE heal and Zenyatta’s Harmony Orb, Ana’s healing abilities require high accuracy. The Ana heroes are on your team need to possess this accuracy, or else the match may be lost. Overall, the brawl is fairly balanced. It’s really a battle of high-health tank heroes combined with a wildcard Ana. Without Ana, it would be a contest of everyone’s individual skill. With Ana, your team is dependent on her healing abilities, which potentially could change the course of an entire match. Playing as a Tank, I found several occasions where I was saved or buffed at perfect time, giving me an advantage. Playing as Ana, it was very rewarding to land clutch heal-shots, and felt like I changed the tide of battle. No matter the gamemode, play was balanced, only being swayed slightly by the Support Sniper. My rating for “Ana Knows Best” is a 3 out of 5. It was balanced even with the new hero changes, but despite the addition of Ana, wasn’t very interesting. However, I felt this brawl was a smart way on Blizzard’s part to introduce Ana. I am very excited to see what Ana has to hold for the future of Overwatch, especially in future Weekly Brawls. My name is Garrett Williams (a.k.a HunGARE), and I do a lot of stuff with computers. I am a game developer, animator, and as you can probably guess, a writer!